Finally! A LONG Bike Ride! 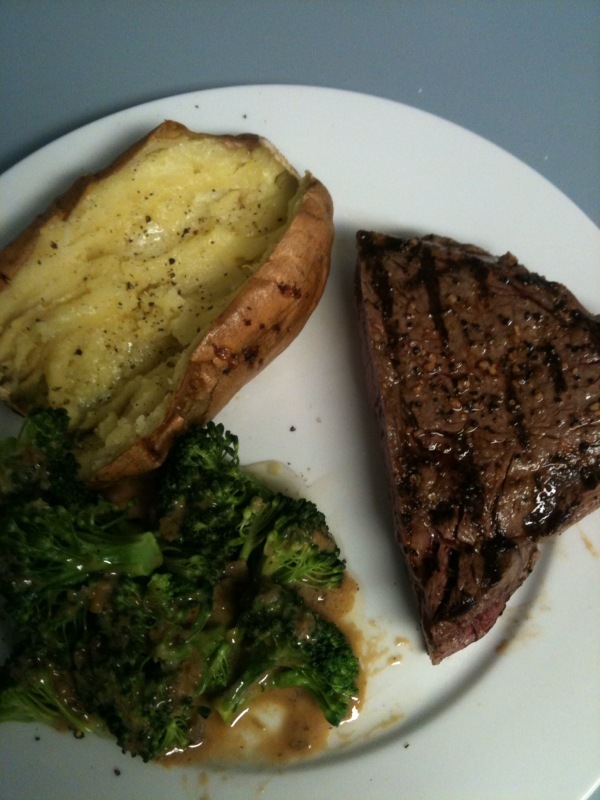 Dinner Saturday night was steak, steamed broccoli and sweet potatoes! It seems to be the perfect dinner after a workout, and also the night before a long workout as well. Sundays are my swim days but today is unusually sunny and warm out. 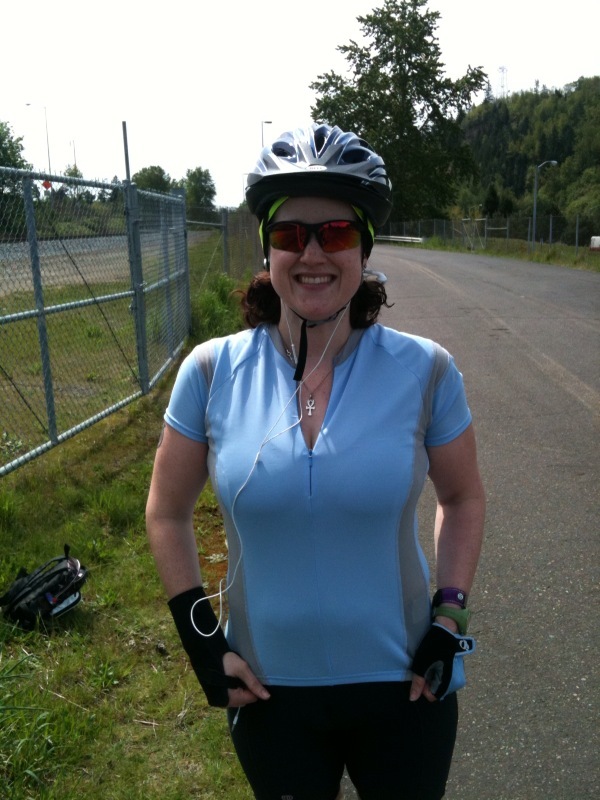 We have less than a month before Reach the Beach and today’s goal is to bike 40 miles. 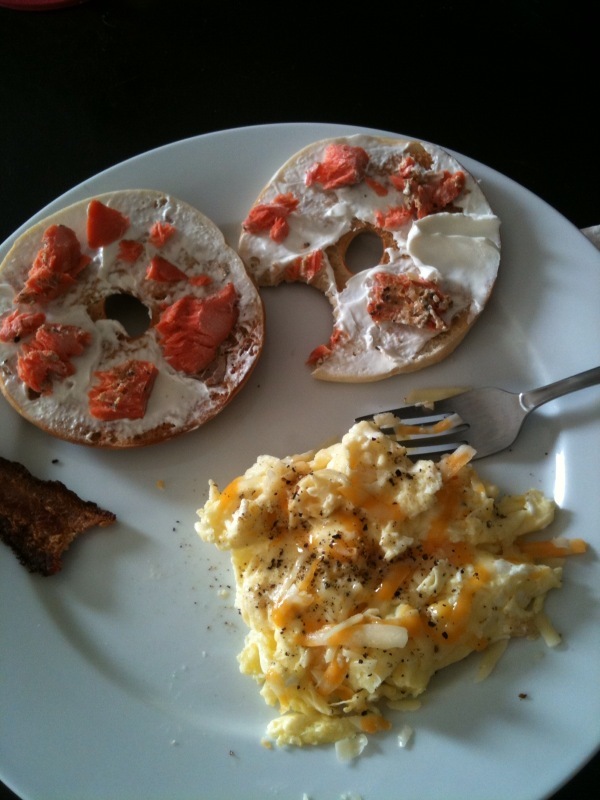 Breakfast was 2 scrambled eggs topped with some shredded cheese, 1/2 a piece of bacon, and a bagel thin with cream cheese and leftover salmon. It was delicious! I packed my small backpack with protein bars and GU. 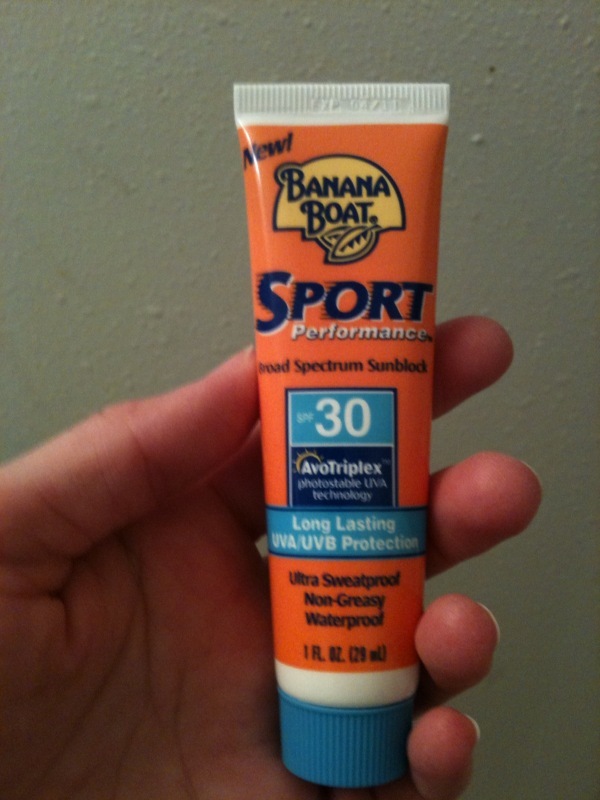 I also slathered myself with sunscreen! I am trying to be better. We headed out for our bike ride around 11:00am or so. 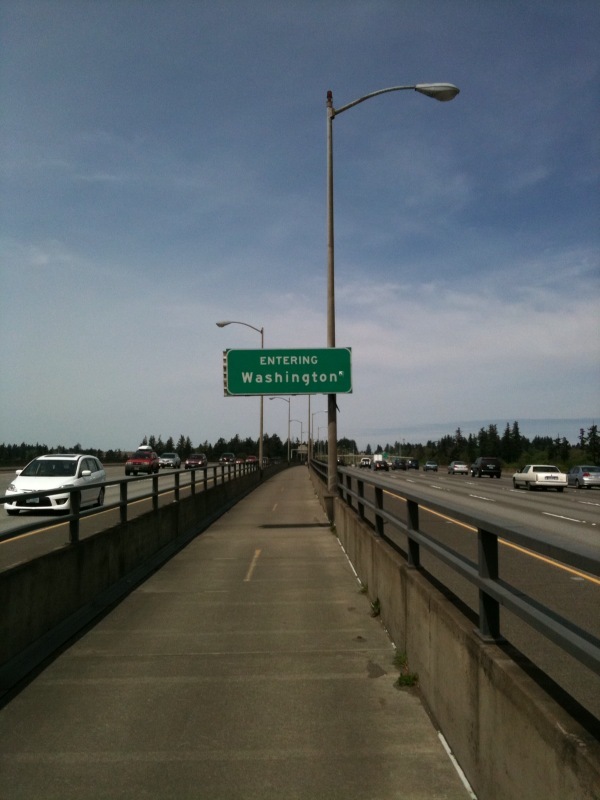 We rode on the path along I-205 all the way to Washington! We had done part of the bike path previously but never made it this far. The sun was out, the temperature was perfect. I wore my wrist brace to see if it helped with the pain and it did. 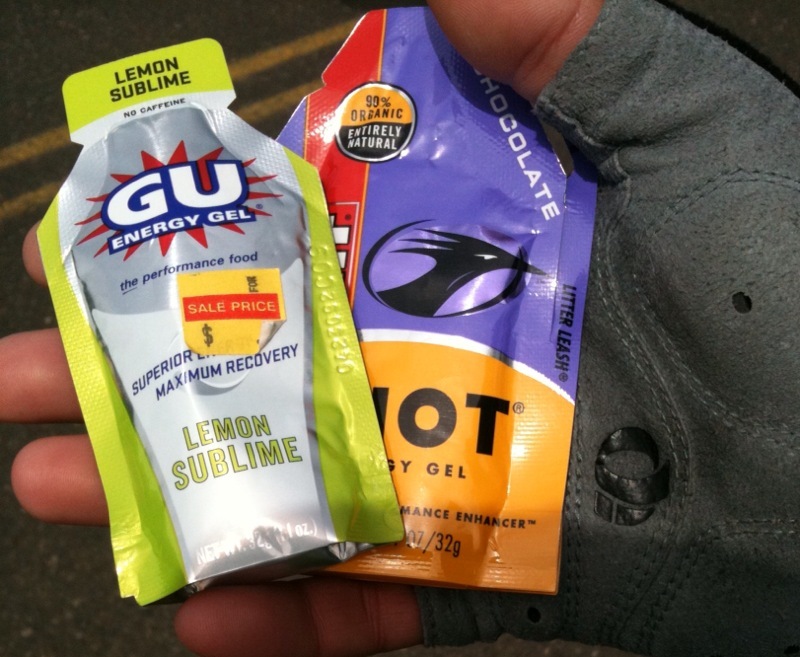 After about an hour, we stopped to rest and eat our GU. 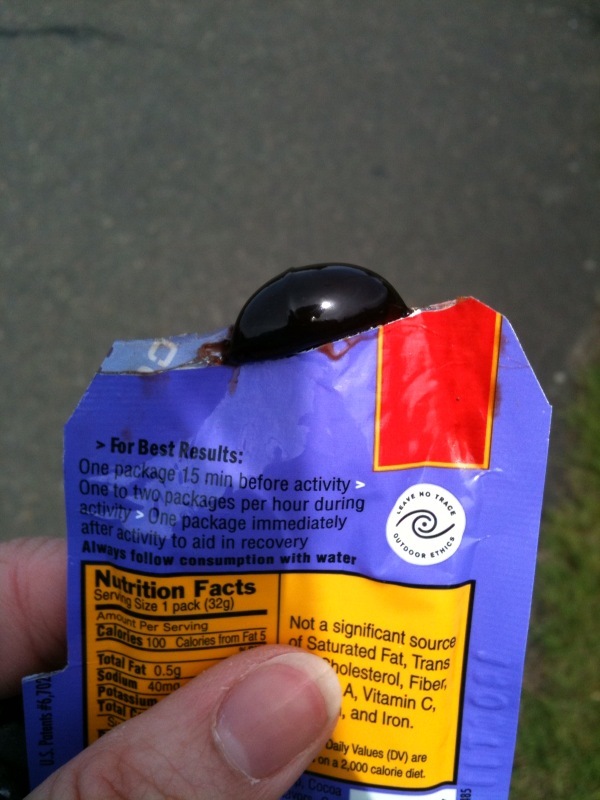 I had the Chocolate. It kinda tasted like chocolate frosting. We continued north. 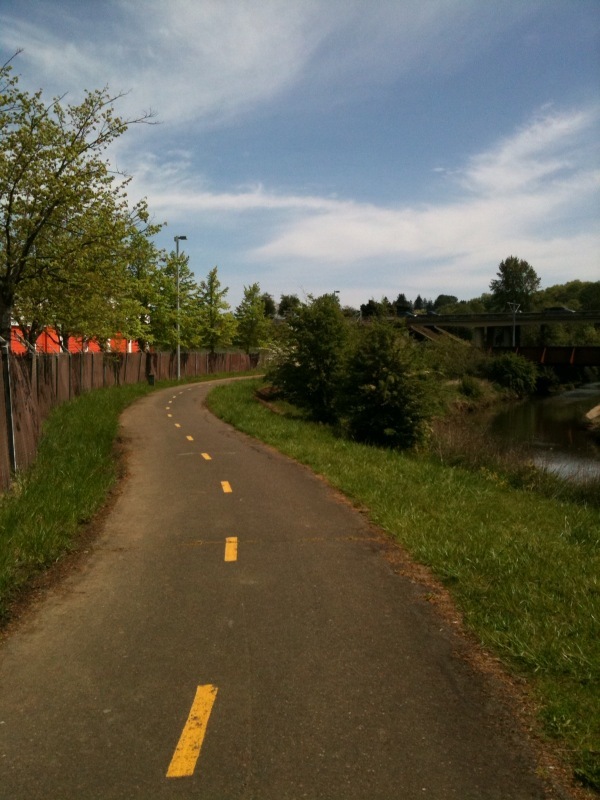 The bike path was really nice. It was kept up nicely, the signs were easy to follow. The path was also very hilly. 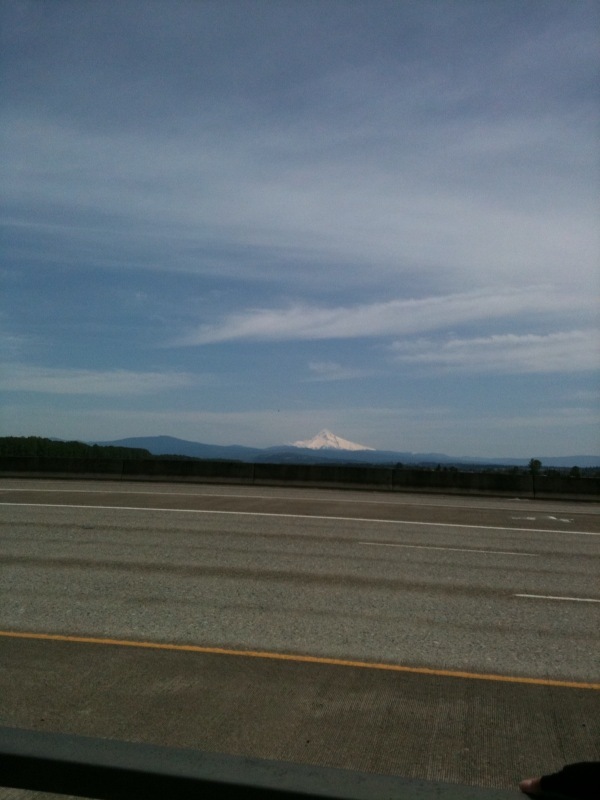 We arrived at the airport and turned toward Washington to continue going north. The bridge that goes over the Columbia River is VERY windy. Always. Whenever we drive across the bridge toward Seattle, the high winds shake the car! Now imagine riding your bike across this bridge! 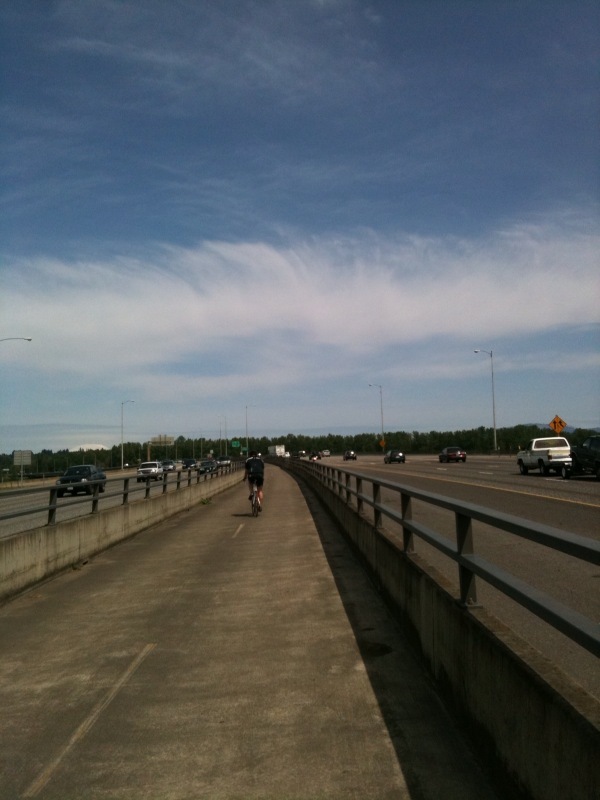 The path goes right down the middle of the freeway. On the right, you can see Mt. Hood. I wish my iPhone had a zoom! It’s weird, but the state line is actually in the middle of the Columbia River. 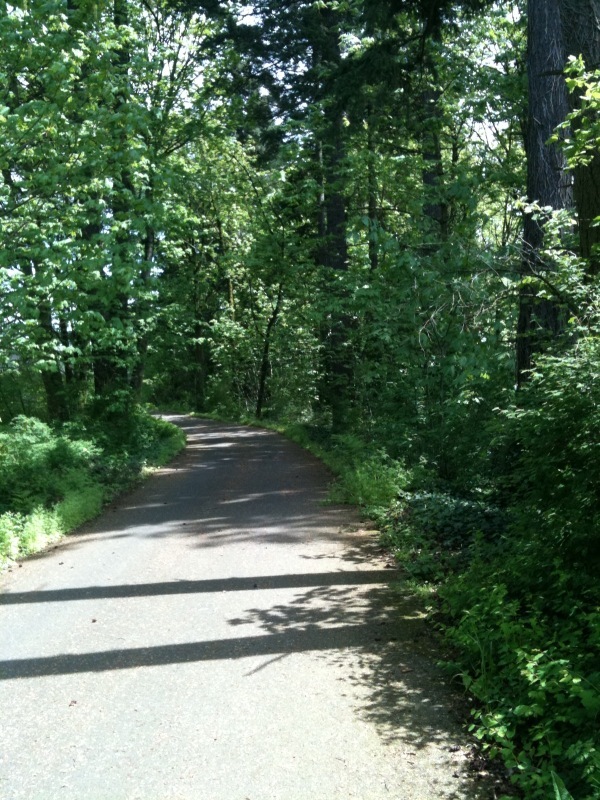 Once we were in Washington we connected to a nice, foresty path for a bit. 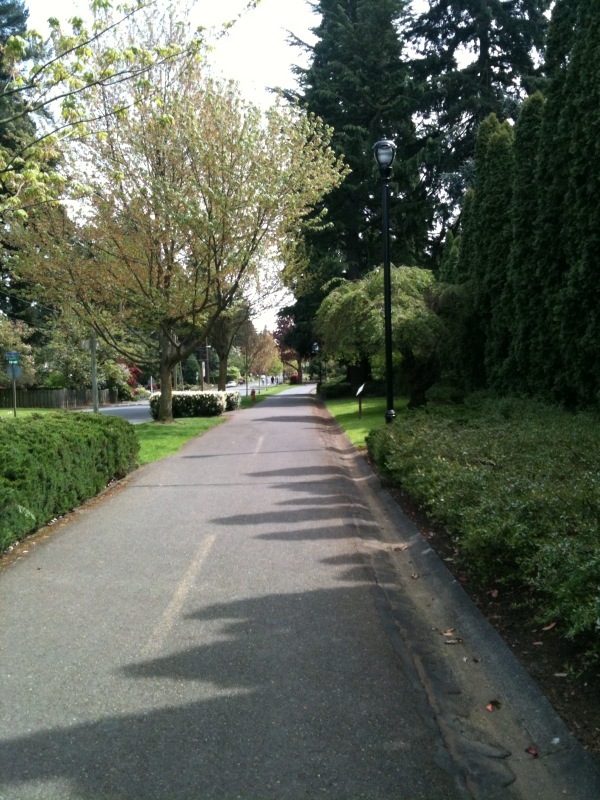 We turned to head to Downtown Vancouver. The idea was to get lunch somewhere. In the end we decided to head back. Neither of us knew the area and we didn’t want to get lost on the way back. The ride back across the bridge was much easier. It was downhill and we finally had the wind at our backs. Around this time I was starting to feel tired, hungry and a bit dizzy. We stopped and ate our protein bars and then continued on. The ride home had a lot of hills! I was out of water and drinking some of Michael’s. Not good. I think I was dehydrated. We arrived home from our bike ride at about 3 hours and 17 minutes. 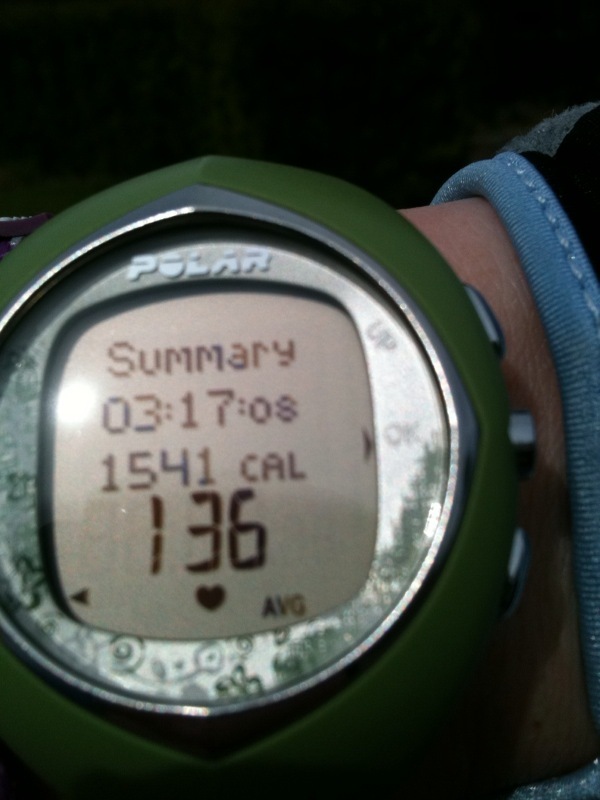 I burned 1541 calories! Today’s goal was to bike 40 miles in preparation of Reach the Beach. We ended up doing 33 miles. I’m happy with our ride today. It was a great day. We showered. I did my Foam Roller. 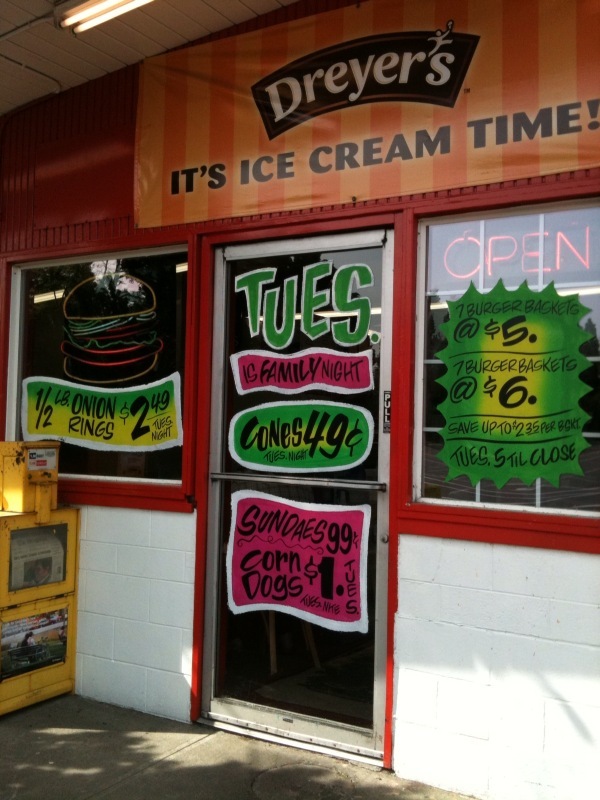 Then we went to Mike’s Drive In for food!!! It was about 3:30 in the afternoon. 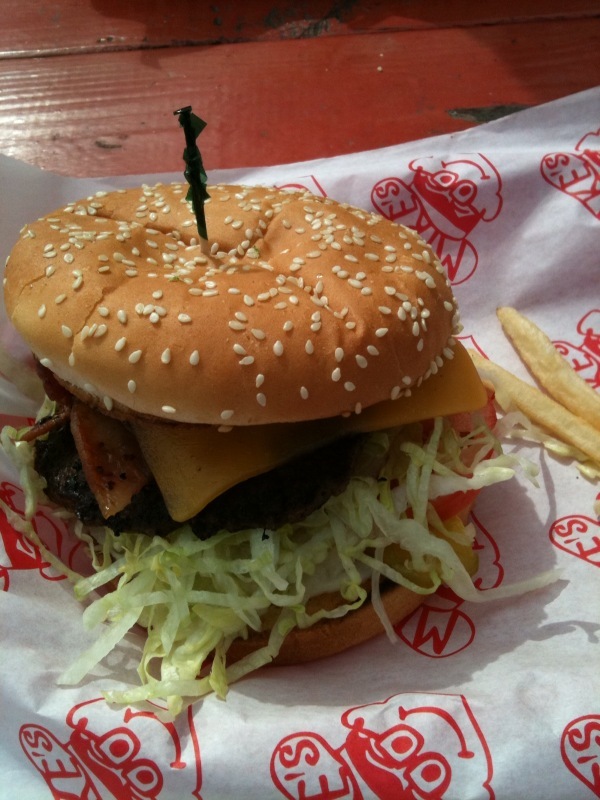 Too late for lunch, too early for dinner. Oh well! We were famished! 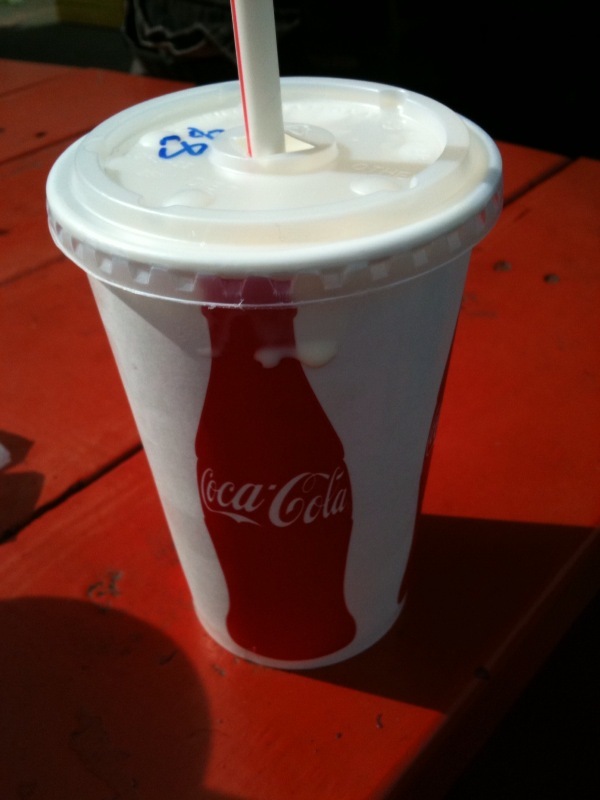 I had a bacon cheeseburger, diet coke and we split a small vanilla milkshake. I snagged a few of Michael’s fries! We sat outside on the picnic table, basking in the sun. And we devoured our food. It was the best!!!! The rest of the day was pretty low-key. We caught up on a bunch of TV shows. Our DVR is 50% full and we’re weeks behind of everything. The only shows we stay current on are Breaking Bad, Lost and Modern Family. My faves! QUESTION: How did you spend your weekend? 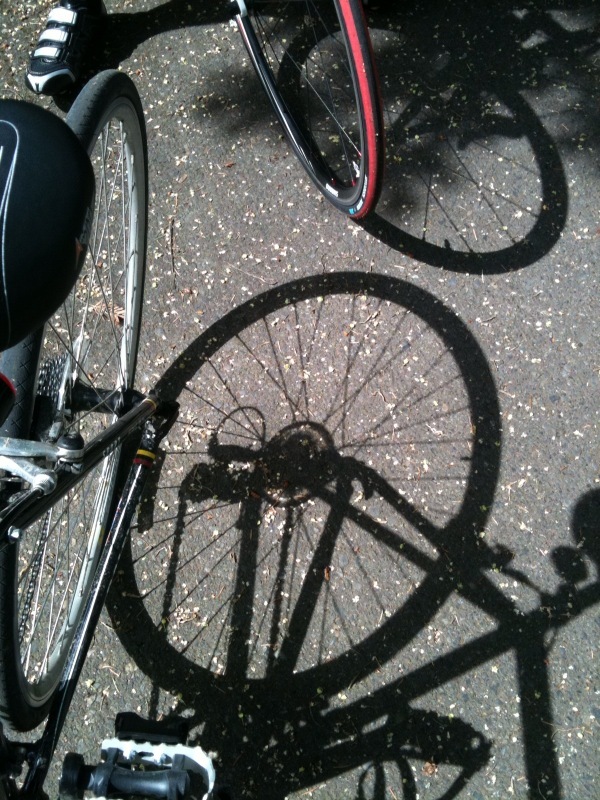 Nice bike ride! There are so many things I want to do and yet feel like I don’t have enough time to get everything done! Ha! This weekend was spent planning out what we’re going to do with the landscaping.